If you haven't heard of Brooke Castillo and The Life Coach School and you LOVE podcasts, hers is the one I highly recommend to everyone I know looking to create a life of their dreams. Her podcast is one that I look forward to every week, and the concepts she teaches have inspired my own Life Coaching practice. Seriously... her teachings are mind-blowing and based on universal truths. The following blog post is based on her teachings. Please check her out if you enjoy the concepts discussed here. Have you ever blocked aside an entire day to write your dissertation? Do you do this on the regular? If you have, then STOP doing it. If you are the type of Doc student who will avoid writing daily during the week and clear an entire day to write on the weekend so that you can catch up on what you were not able to get done during the week, I want you to lean in while I drop this truth bomb on you. All with LOVE, of course.... because I believe in you and want you to FINISH. So what happens when you block an entire day to "work on your dissertation"? I'll tell you what happens based on my experiences with the amazing women I coach. 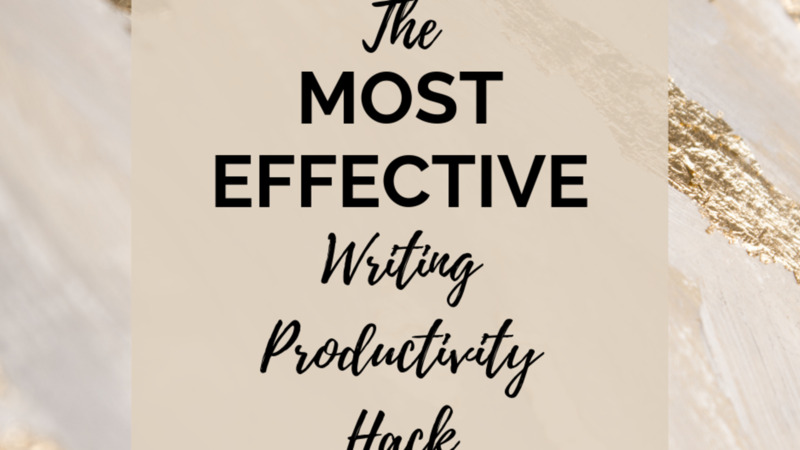 You neglect to get into a daily writing flow because you just chalk it up to the fact that you'll get a TON done over the weekend. The weekend arrives, and you check Facebook, Instagram, Twitter, answer emails, procrasti-clean, and maybe even a little vacation planning/research. Then, you start downloading more research articles to add to the hundreds you already have. Do you know what doesn't get done that weekend? Any real writing, or any real progress. Now maybe you are a freakin' GO-GETTER and slay the weekends, but my hunch is that if you are reading this blog post, you can relate to the above scenario. You see... the problem is that you give yourself too much time to write. So here's what you can do to start making consistent progress on your dissertation. Sit down to PRODUCE, not to “work”. Give yourself no more than two-hour windows to write. If you allow yourself an entire day, you are going to spin your wheels and goof off on social media for hours. Set writing goals that inspire you to take action and produce an OUTCOME. So much of the dissertation writing process is about managing your mind. There is no way around it. Because you understand what you need to do in order to write the dissertation. You know the sections to be included, the theories you will be exploring, the lens you will use to interpret your research, but until you understand that what you think about is going to create the emotion that either drives the action or the inaction, you are never going to take the action. How many times have you sat around procrastinating and then beat yourselves up for procrastinating? We really want to be making progress and finishing the dissertation so we can move on with our lives... so WHY are we not taking action? And so then it becomes a negative spiral. It is really important to pay attention to the emotion that is fueling the action. So if you are being fueled by stress, and fear, and panic, you are not going to be able to produce at the level that you want to produce. This is when you will know that you are on the state of what Brooke calls “the busy hustle”. You will not have the results. You’ll be working all day with nothing to show for it. It is very hard to produce from negative emotion. Because if you think about when you are on a deadline with your chair, you get to a point where you tell yourself, "OK that’s enough stress... now it’s time to get to work", and that is when we actually start producing. This concept is a paradigm shift, as you move from a "tired hustle" typically fueled by negative emotion, to a "productive hustle" fueled by your desire to accomplish something. How will you know if you are being productive? You will actually produce something. A few pages of thought, a robust argument brought to life on the page... this is how you will know the shift has happened. You will feel GOOD about your writing sessions, and seeing the progress that you have made will motivate more action. Never just to say you’re busy. You’re either producing or you’re not. When you set an entire day to work on something, be honest. Is the action that you are taking, getting you closer to the finish line? At the end of it, you’re working hard, but you’re not actually producing anything. We do this all the time... we will say we're going to go work on the dissertation and will spend eight hours working on it, but don’t produce anything. I also love that Brooke talks about passive and massive action and the distinction between the two concepts. Passive action - Feels like we are producing something, but we really aren’t. We aren’t producing a result. This does NOT COUNT. Organizing, downloading research articles, planning, coursework, learning things, etc. Massive action - WRITING. Reading and reviewing. Since we are afraid of FAILURE, we tend to stay in passive action. There’s no risk... it feels safe. Give yourself small segments of time, and you will BLOW YOUR MIND at how much you can do and watch your productivity SKYROCKET. If you can’t get your work done in shorter increments of time, you are being sloppy with your thinking. Be clear about what you WANT to produce! Prior to your writing session, layout very clear expectations on what you will get done during that time frame, and hold yourself accountable to it. When you sit down to write, you will have a clear plan on what needs to happen within that time frame. It's a no brainer. Start the clock, and WRITE what you said you were going to write. If you sit down to “work on something” that is the WORST you can do! Don’t sit down to WORK on something, sit down to PRODUCE something! At the end of your time working, you WILL HAVE A RESULT! And, when you build up MANY MANY results, you will have made SIGNIFICANT progress on your dissertation. So, pick a time frame, and outline what you want to produce. Don’t give yourself 3 days to produce something... give yourself 2 hours on Monday, 2 hours on Tuesday, 2 hours on Wednesday. DONE. Be SPECIFIC. And when you get to work, you know you have SO Much to do in such a short time, that you don’t spend a lot of time beating up on yourself and surrounding yourself in negative emotion. YOUR BRAIN is literally wired to avoid failure. The only way to get through the dissertation (really) is to fail repeatedly. Let me know if you commit to working to produce. Share the progress and shifts that happen in the comments below! Dissertation Tips Sent Directly to Your Inbox! Join our email list to receive dissertation tips, tricks, and encouragement sent directly to your inbox. Don't worry, your information is safe with us and will never be shared. 10 Strategies for Getting Unstuck In Writing Your Dissertation! Would you stand your Bestie up at the Coffee Shop? My Coaching Client List is Currently FULL, but will open again in February. Join the waitlist to be notified when enrollment opens again! Enter your email below to be notified when "Write The Damn Dissertation" coaching program opens. We think spam is worse than swimsuit shopping after eating a bag of easter candy so we'll only email you when we have something useful to send you.